The United States has a military unlike any other. Specifically, we are fortunate enough to have a maritime tour de force. As such, the Marine Corps and Navy often times operate hand in hand. Consequently, one of the many things that we use in conjunction with the Navy is their terminology. Learn more in our first piece. 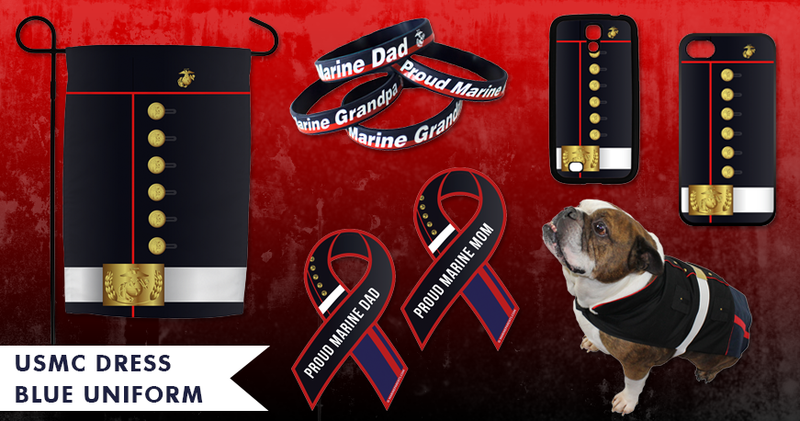 The Marine Corps has a rich and proud tradition. The countless battle streamers earned by each individual unit is a testament to this fact. There are many things that the Corps does that sets it apart from the other branches of service. However, the Marine Corps has always had a long standing history with the U.S. Navy. This is to be expected, considering that the Marine Corps falls under the Department of the Navy. Consequently, one of the many things that we use in conjunction with the Navy is their terminology. 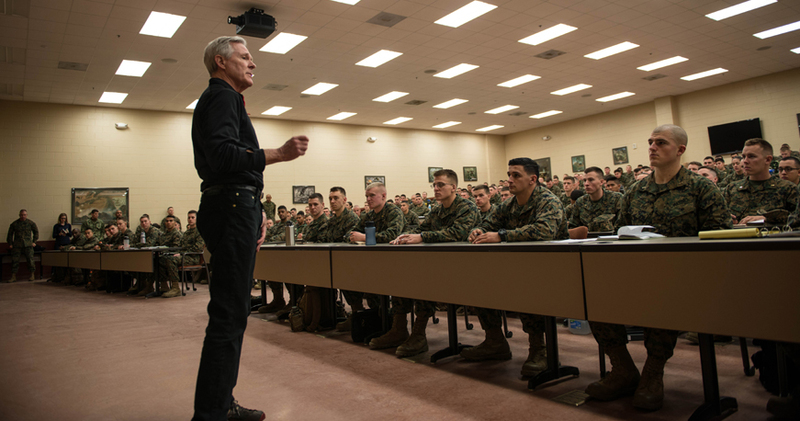 *Image info: Secretary of the Navy Ray Mabus speaks to a classroom of Marine Corps officers at The Basic School about the future of the Marine Corps during his visit to Marine Corps Base Quantico, Virginia, January 27, 2016. (USMC photo by Sergeant Cuong Le). 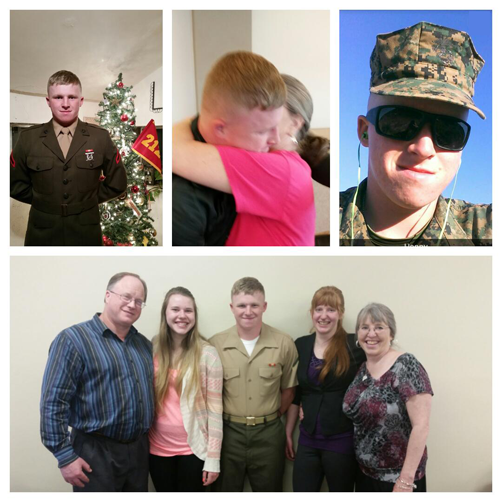 This week's featured volunteer is a proud Marine mother from Maryland--Robin Perry. 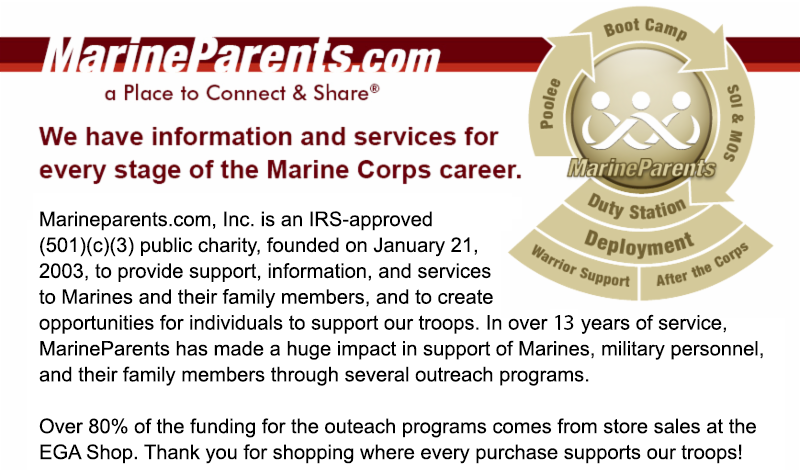 Robin has volunteered for Marine Parents since December of 2015 and currently serves as the Company Leader for our Official MarineParents.com Facebook Group for Golf Company, Parris Island. According to MarineParents.com's Facebook Groups Manager, Teresita Reynolds, "Robin has a generous heart and faithfully provides information to the members of Golf Company. Robin's spirit immediately makes you feel comfortable. She always provides our members with her warm guidance and support." *Image info: Robin Perry. (Image used with permission). 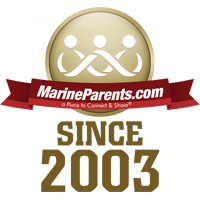 This week's featured TMP participant is a proud Marine mother from Idaho--Lori Weiler. Lori is married with four children and two grandsons. Lori's Marine son is her youngest child and she could not be prouder that he followed in his father's footsteps by joining the Corps. 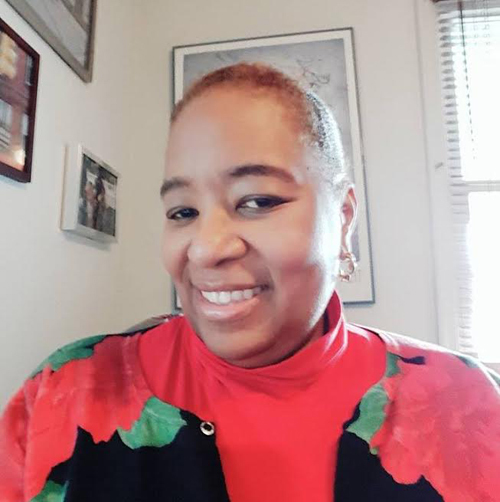 So far, Lori has raised almost $300, and with your support and generosity, we know she can reach her $500 fundraising goal by the time she runs in this year's Marine Corps Marathon. Thank you, Lori, for being a part of the team and good luck in October! 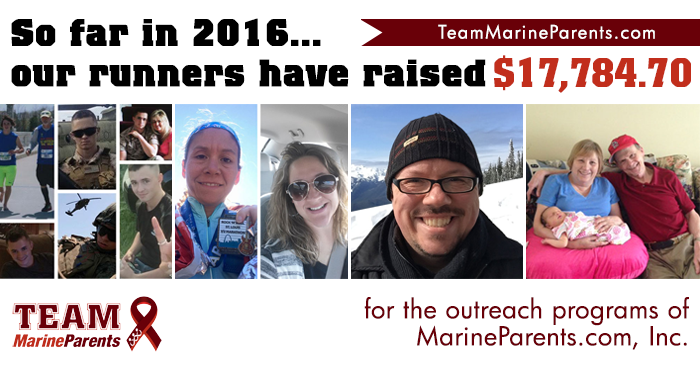 *Image info: Lori, her Marine, and her family. (Image used with permission). John Basilone, one of the most legendary and revered Marines in the history of the Corps, was honored again this week in a ceremony at Camp Pendleton, California. Secretary of the Navy Ray Mabus visited the base this Tuesday, August 16, to announce plans to name a future destroyer after the legendary Gunnery Sergeant. Basilone previously had a warship named after him, an older-generation destroyer, that was decommissioned in 1977. 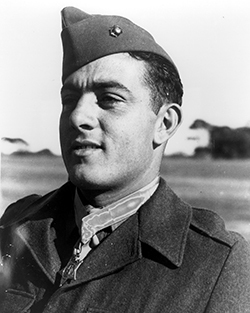 *Image info: Sergeant John Basilone. (USMC photo/released). A Boy Scout pocket knife recently helped identify the remains of a World War II Marine who was killed on the first day of the Battle of Tarawa on November 20, 1943. 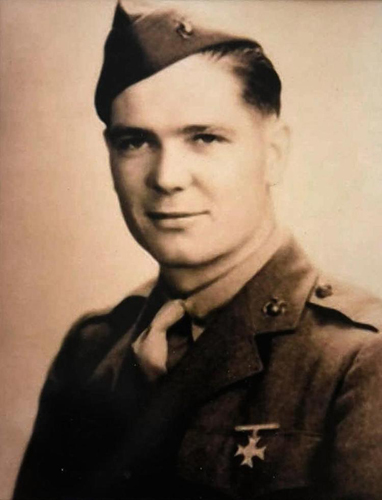 The remains of Private First Class George Traver, of Chatham, New York, were among those of dozens of Marines discovered last year in a mass grave on Betio Island, Tarawa Atoll by History Flight, a Florida-based non-profit organization. When the grave discovered, a Boy Scout pocket knife that Traver's mother had sent him after he enlisted in the Corps was found on his body. The pocket knife, along with military dental records, confirmed Traver's identity. Traver was one of approximately 1,000 Marines and sailors killed during the battle, while another 2,000 were wounded. He was 25 years old. *Image info: Private First Class George Traver died on the first day of battle of Tarawa, November 20, 1943. (Department of Defense image/released). The Marine Corps has recently begun an 18-month experiment that will shape the future of basic infantry units. Kilo Company, 3rd Battalion, 5th Marines, was chosen earlier this year by Marine Corps Commandant General Robert Neller to test and assess new gear for potential use in future warfare. "Future threats will evolve in ways that the current force is not postured to address," Neller said in a statement. "Our potential and current adversaries continually innovate and develop new capabilities, many of which now equal or exceed our own. This unstable and increasingly dangerous global situation is further complicated by a constrained resource environment." 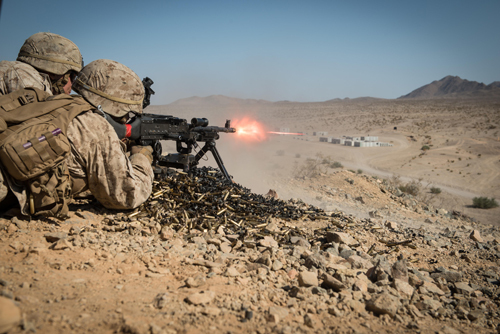 *Image info: A Marine with Kilo Company, 3rd Battalion, 5th Marine Regiment, provides cover fire for his squad during the Marine Air-Ground Task Force Integrated Experiment (MIX-16) at Marine Corps Air Ground Combat Center Twentynine Palms, California, August 5, 2016. (Department of Defense image/released). 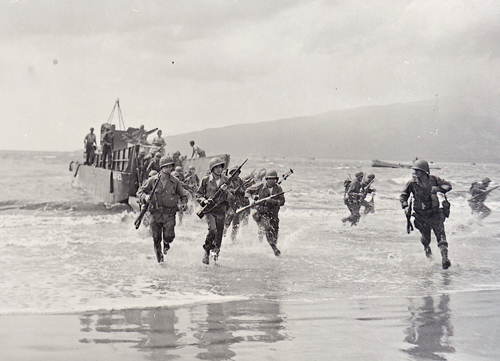 Seventy-four years ago this week, on August 17, 1942, the 2nd Marine Raider Battalion under Lieutenant Colonel Evans F. Carlson landed on Makin Island. The Raiders, who were launched from the submarines Nautilus andArgonaut, destroyed a seaplane base, two radio stations, and a supply warehouse, in addition to killing approximately 100 Japanese soldiers before leaving the island the following day. *Image info: Marine Raiders in Operation at Makin Island, 1943. (U.S. government photo/released).